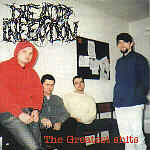 DEAD INFECTION was formed in January 1990 by Cyjan-dr. and Domin-g.,voc. /-ex members of grindcore band FRONT TERROR/. A few months later guitarplayer Jackson is involved. The band starts to play first shows. In the meantime, Cyjan meets Kelner-g. and Maly-g. and supports them in their deathmetal project called TERMINATOR. After short cooperation Jackson leaves DEAD INFECTION. Because TERMINATOR gets some line-up problems as well, Kelner and Maly decide to break up their band and at Cyjan's request they join DEAD INFECTION. When the line-up seems to be stabilized, Domin suddenly leaves the band. But soon, bassplayer Golab /-ex D.O.C./ is involved and Kelener takes vocal parts. The band starts workin' on a first demo tape. 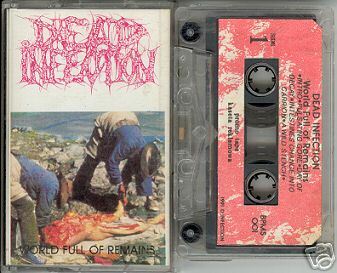 In summer '91 "World full of remains" tape is released. This work gets a lot of good reviews and the band playes shows across Poland. On autumn, because of personal matters, Kelner leaves the band. Then guitarplayer Tocha is involved pretty soon and Golab takes vocal parts. The band prepares songs for a second demo tape. In spring '92 "Start human slaughter" tape is released. In summer, the band takes a part on a biggest polish festivals like "Jarocin", "Shark attack", "Strashydlo", playing along with bands like: VADER, DISHARMONIC ORCHESTRA, MORGOTH, SAMAEL, EXCULCERATION. Second tape makes the band famous abroad where it gets very good reviews. In autumn, because of internal misunderstandings, Golab is removed from DEAD INFECTION and his place is taken by Kelner again. In December, the band playes the first show abroad, in St. Petersburg /Russia/. In spring '93, the band gets offer from german label "Morbid rec." for releasing a full length album. 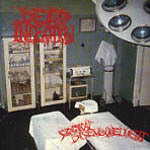 In summer '93, "Surgical disembowelment" LP/CD is released. The band keeps playing a lot of shows in Poland and on autumn goes out to Germany for mini tour along with PROTECTOR. In spring '94, Kelner finally leaves the band. Not much longer new singer Jaro is involved. In May '94, "Party's over" split 'EP with BLOOD is released and the band plays more shows abroad. In early '95, the band gets another offer for releasing second full lenght album. In summer '95 "A chapter of accidents" CD is released. 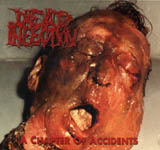 On this release, the band returned to the roots of grindcore. The band still plays a lot of shows in Europe including great mini tour with REGURGITATE. 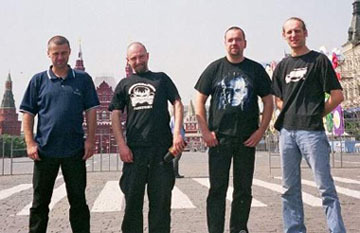 Year '96 brings a big European tour called "Grind over Europe". DEAD INFECTION plays as a headliner and is supported by HAEMORRHAGE and C.S.S.O. Also other bands like INHUME, AGATHOCLES, MALIGNANT TUMOUR, MUCOPURULENT appear on individual shows of this tour. In the year '97 old demos are released in CD format with common title "Human slaughter...till remains". The band plays shows in Netherlands and Belgium along with INHUME and LAST DAYS OF HUMANITY. Year '98 brings another three releases: "Poppy seed cake" split 'EP with C.S.S.O. 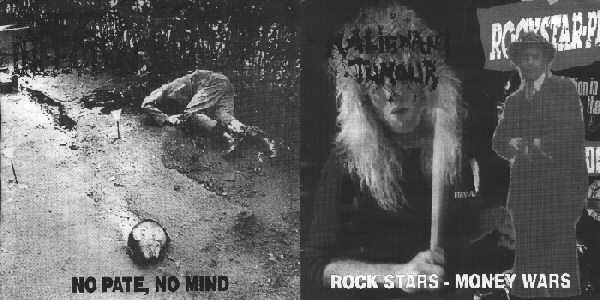 , "No pate, no mind" split 'EP with MALIGNANT TUMOUR and "The greatest shits" MCD including cover-songs from cult bands like: CARCASS, NAPALM DEATH, GENERAL SURGERY, REGURGITATE and... BEE GEES. In January '99, the band plays his last show in Paris. Soon Cyjan decides to disband DEAD INFECTION. In the year '00 Cyjan formes his own project SPINELESS, and Tocha and Jaro form COFFEE GRINDERS. 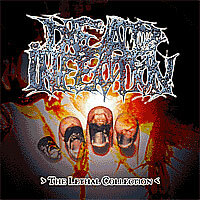 In the year '01 DEAD INFECTION take his part on "Requiem of revulsion" CD /CARCASS tribute/. The band plays a song "Pungent excruciation". Towards the end of the year '02, Cyjan decides to bring DEAD INFECTION back to life. Reunion line-up is: Cyjan, Jaro and Tocha. 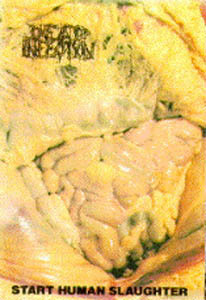 Towards the end of '04, "Brain corrosion" CD is released. In the meantime, the band plays shows and tours around the world including all Europe and Japan. In spring '05, bassplayer Pierscien (INCARNATED) is involved. In spring '06 Tocha leaves the band, and Pierscien takes guitar parts. New bassplayer is Hal (HERMH, ABUSED MAJESTY). In autumn, Jaro leaves the band. "World full of remains" demo and "Brain corrosion" album are released in LP format. Now the band is engaged on a new album which is out on 2007.